While the RoboRoach is not a real-life Terminator, the company behind the electro-bug, Backyard Brains, is touting it as the first commercially available cyborg. They're looking to raise $10,000, via a Kickstarter campaign, to manufacture these insect-machines. A cyborg is short for "cybernetic organism" and has both organic and cybernetic parts. That's exactly what the RoboRoach is; part electronic robot, part real-live cockroach. The design was created by the Backyard Brains, which is a start-up group of scientists who focus on creating neuroscience projects for students. The RoboRoach works by innervating neurons in the cockroach's antennae with small electrical impulses that are controlled via the RoboRoach smartphone app. Cockroaches use their antennae to feel and even smell the world around them, so they are ultimately guided through their surroundings by these body parts. The cockroach has a small surgery to implant a "backpack." The pack initiates an electrical signal to the cockroach's antennae to trick the cockroach into thinking that there is an obstacle in its way. 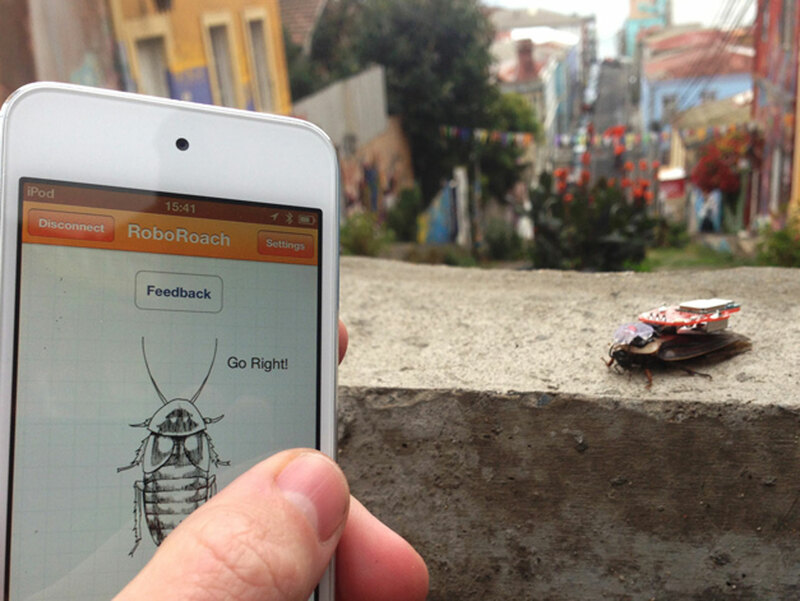 "Our RoboRoach App allows the user the ability to steer the cockroach left or right by a simple swipe of the screen in the direction he or she wants to stimulate," explained Backyard Brain's RoboRoach production manager Bill Reith in an email to CBSNews.com. "Additionally, the user can learn and engage in real life science by experimenting with different frequencies, durations, and pulse widths of the neural stimulation." While they're using real roaches, Reith explains that it doesn't hurt or harm the insect -- in this case a Blaberus discoidalis, or simply discoids, which are native to South America. The roaches grow up to three inches long and cannot climb up smooth surfaces or fly, even though they have wings as an adult. "It's nearly impossible to adapt to something painful, but these roaches adapt quite quickly, which makes us believe that this is simply causing sensory neurons to fire," explained Reith. "Also, cockroaches have a defined response when they are scared or hurt (they throw up), but we've not seen that." Reith also said that once the backpack is removed, the insect can continue to eat, breed and live out a normal cockroach life. The Kickstarter campaign has already raised more than $6,000, with 25 days left to go. If the project is funded each person that donates $100 will receive a RoboRoach kit that includes all the cyborg parts to create a RoboRoach. Donators just need to supply their own organic material: the cockroach. While it might seem like all fun and games, the Backyard Brains started their Kickstarter campaign to impact the advancement of basic neuroscience research. The RoboRoach platform will allow students to test a wide range of stimulation parameters currently used in the medical field. According to Reith, currently 20 percent of the world has or will have a neurological disorder in their lifetime and there are no known cures. "The fantastic fact is that discoids have an information highway composed of action-potential-generating neurons just like humans do. So, much can be learned about our own brains by observing and interacting with theirs," said Reith.